ABC News looks back 12 years after the invasion of Iraq. camera (Alex Wong/Getty Images) Then President George W. Bush addresses the nation, March 19, 2003, in the Oval Office of the White House in Washington. 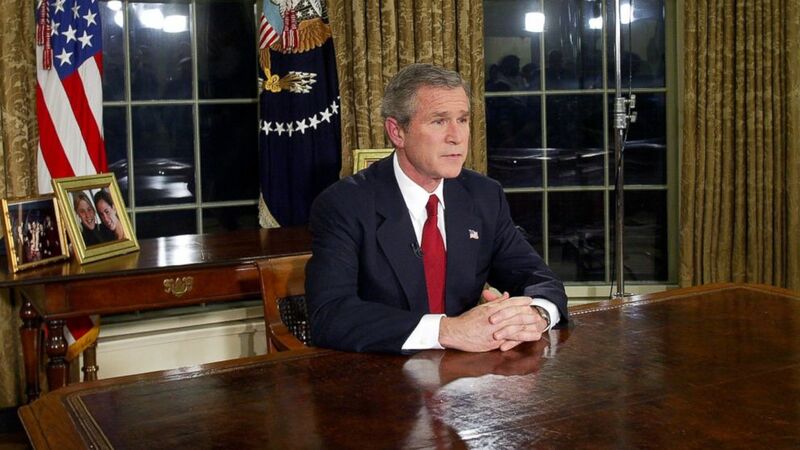 On March 19, 2003, millions of Americans watched as President George W. Bush announced from the Oval Office that Americans and coalition forces had begun military operations inside Iraq against the regime of Saddam Hussein. But 12 years later President Obama has ordered a U.S. military presence back into Iraq to assist with the fight against ISIS, four years after he oversaw the complete withdrawal of all U.S. troops in December 2011. ABC News took a look back on the past dozen years and the events and players who shaped one of the more divisive and consequential conflicts in recent history. 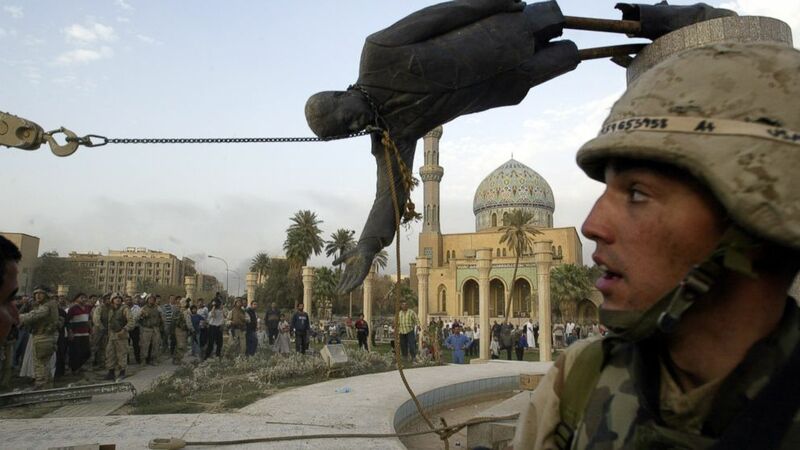 (Jerome Delay/AP Photo) The April 9, 2003 file photo shows Iraqi civilians and U.S. soldiers pulling down a statue of Saddam Hussein in downtown Baghdad. THEN: At the start of the 2003 military campaign, Saddam Hussein had been president of Iraq for more than two decades after seizing power in a 1979 Ba’athist party coup. When the U.S. “shock and awe” bombing campaign began in March Saddam escaped Baghdad and went into hiding. A month later, Iraqi citizens aided by U.S. troops brought down Hussein’s statue in Baghdad’s Firdos Square that had been erected for his 65th birthday. The toppling of the statue became one of the war’s most iconic images. From the ABC News Archives: Where Is Saddam Hussein? In December 2003, U.S. military forces found Hussein near his hometown of Tikrit hiding in a spider hole in the ground below a two-room mud shack on a sheep farm. 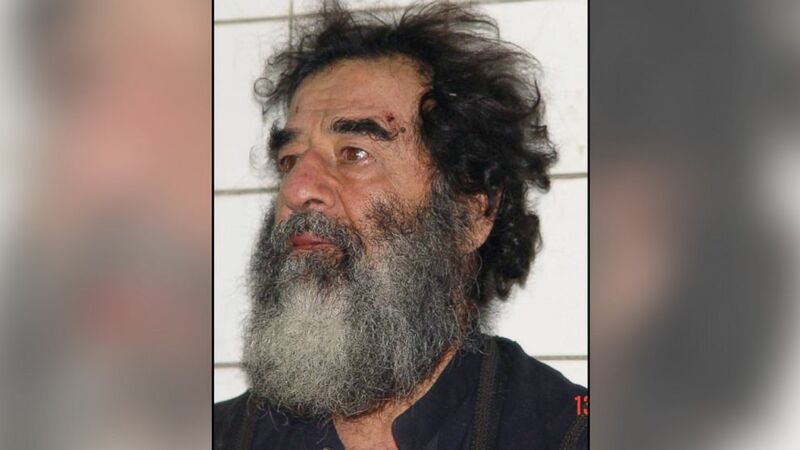 (U.S. Army/Getty Images) A handout photo of Saddam Hussein after his capture in Iraq, Dec. 14, 2003. NOW: In December 2006, Hussein was executed after being found guilty of crimes against humanity by an Iraqi Tribunal. Now the Associated Press reports that Hussein’s grave, located outside the city of Tikrit, has been nearly destroyed in the ongoing fight between Iraqi forces and ISIS. 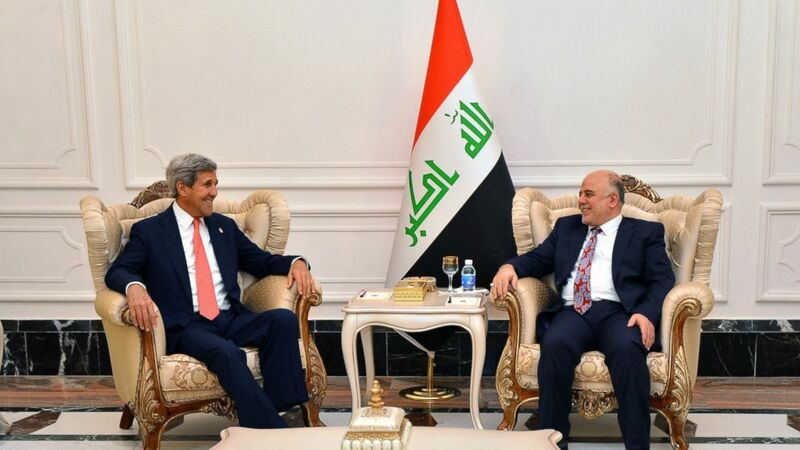 (Iraqi Prime Ministery/Anadolu Agency/Getty Images) Secretary of State John Kerry meets with Haider al-Abadi, Prime Minister of Iraq, in Baghdad, Sept. 10, 2014. Today Haider al-Abadi is Iraq’s prime minister. He returned to Iraq in 2003 after having spent 30 years in exile, and has struggled to hold together sectarian interests and fend off the rapid advancement of ISIS, which currently controls vast swathes of land in the country’s northwestern region including the second-largest city of Mosul. THEN: 90,000 U.S. service members were involved in the 2003 ground invasion of Iraq. But by 2007 the number of additional American forces rose to 160,000 as President Bush ordered a surge of troops to help quell the sectarian strife that had consumed Iraq. More than 4,400 U.S. service members lost their lives in Iraq, with more than 33,000 wounded. At least 150,000 Iraqi civilians are estimated to have been killed in the conflict between 2003 and 2013. 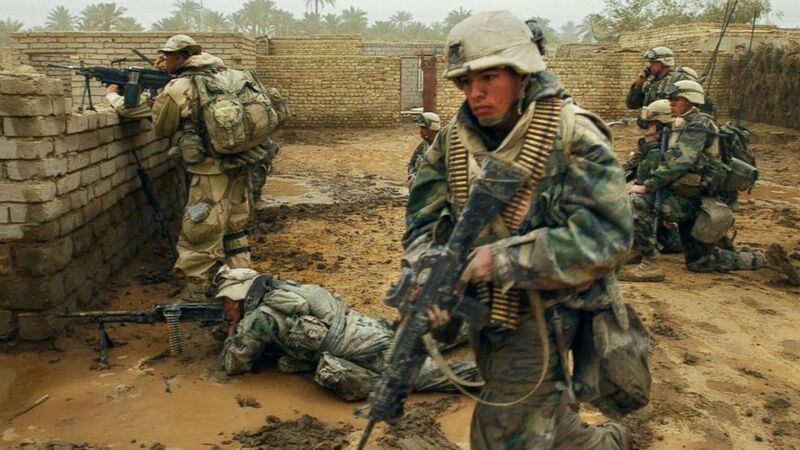 (Eric Feferberg/AFP/Getty Images) US marines from the 2nd Battalion 8th Regiment take their position in the southern city of Nasiriyah, Iraq, March 26, 2003, during an evacuation of the population living in the area where there was an Iraqi attack the day before. NOW: After the ground invasion the U.S. disbanded what was one of the Middle East’s largest armies. Disenchanted former soldiers soon joined the ranks of the insurgency, fueling a spiral of violence that dominated the American occupation. Meanwhile the U.S. struggled for years to rebuild a capable military from scratch. 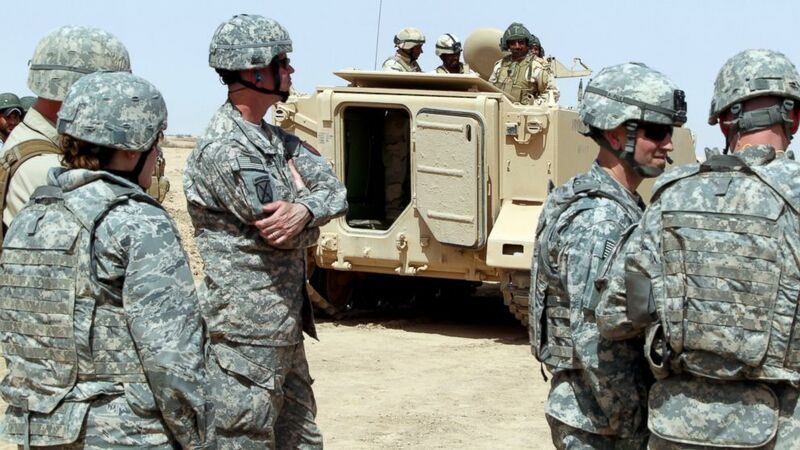 By the time all U.S. military forces left in 2011 American military officials were confident that Iraq’s military had been rebuilt into a professional force. But with no security agreement between the two countries, the Army’s skills and professionalism eroded under the government of Prime Minister Maliki as training was reduced and he replaced Sunni commanders with Shiites. Today 2,875 American service members are in Iraq to advise, train and assist Iraq’s military so it can defeat ISIS. (Ahmad Al-Rubaye/AFP/Getty Images) United States military observers look on as Iraqi soldiers attend training at the Besmaya military base in southern Baghdad, April 24, 2012. THEN: In 2003, Iran’s presence in Iraq was virtually non-existent. NOW: The relationship between the two Shiite-majority countries is tighter than it has ever been. Iran has also taken a prominent position in the country’s fight against ISIS, sending 50 to 60 military advisers to Iraq and helping direct the large offensive on the ISIS held city of Tikrit. THEN: 12 years ago Hussein’s Sunni-led government oppressed the majority Shiite population for decades. NOW: The end of the Hussein regime brought democratic elections that shifted the balance of power to Shiites. And after being repressed for decades, sectarian divisions developed into full-scale conflict. Sectarian violence, even at its lowest levels, has become a part of daily life inside Iraq. In 2014, the country suffered the highest number of civilian deaths since 2008.